Naturalists are people interested in nature and natural history. Field naturalists go into the fields, rather than work from an office. The fields may be bushland or forest, farmland, roadsides, aquatic areas or urban areas. Field naturalists may be professionals or non-professional. They may be experts or non-experts. Many belong to a field naturalists club because it gives the opportunity to experience and learn about nature at first hand. A typical field naturalists club will meet regularly, usually once each month in the evening. The meetings usually have a short business section, a guest speaker who will address the meeting on some topic related to natural history, and a specimen/observation section. Some clubs have special interest groups, such as botany, bird observation or conservation. Most clubs hold regular outings. Outings may be for half a day, a full day, a weekend. Occasionally longer campouts are held. Hopetoun Falls. Photo: Lorraine Phelan. by making informed comment on conservation issues. 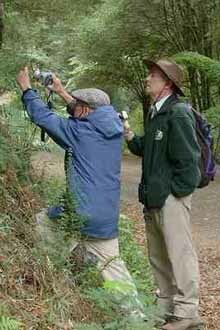 Many field naturalists and field naturalist clubs make regular and occasional surveys to help document local natural history. These surveys include birds, mammals and other vertebrates, invertebrates, fungi and ecology. Many clubs publish the material, in their newsletters, on their web site, in books and pamphlets, or on CD. Contact your local club for more information.